As the global market increasingly caters towards a digital economy and online shopping, it is anticipated that warehouses and distribution centers will turn towards more automation. Distribution center automation is becoming one of the greatest supply chain trends of 2017. E-commerce creates this demand for automation which companies use to their advantage to remain competitive. Now, companies engaging in research and development efforts to explore warehouse and distribution center automation are eligible for research and development tax credits. Companies that offer their products online are challenged with recent consumer demand increases as online shopping becomes more popular. To remain in the market, these companies are “hiring” robots to fulfill some of the tasks human laborers are overburdened with in warehouses and distribution centers. Many robots in these settings transport products on the floor, saving people the time it takes to traverse the space looking for products in an order. Before the robots, people would walk miles a day to pick items off shelves and put them in boxes. Now, robots complete tasks of loading and unloading, retrieving and putting away, as well as pallet stacking. On a global scale, the International Federation of Robots (IFR) anticipates a 15% annual growth rate of robot implementation in warehousing and distribution center applications. In warehouses, the most time consuming activity is picking, which involves taking items off shelves when an order is placed. The most effort in this operation consists of traveling to pick up the product and bring it to the next location. Research to automate the process found that increasing productivity can result from dividing picking into separate jobs. In other words, the traveling task would be separated from the picking task. The former can be fulfilled by a robot. In automating the entire picking process, ASRS technology is employed. This acronym stands for automated storage and retrieval system. ASRS includes computer-controlled systems that facilitate robots to automatically place loads from defined storage locations. As a result, there is more dynamic and accurate case delivery to locations along the racks where pickers must retrieve them. ASRS eliminates extensive travel times required in the traditional, manual picking process. Automation of this process also resulted in creating multi-level racking systems. Robo-carts are placed on each level with instructions to only pick up products on that level that are requested by an order. Once the product is retrieved, the robo-cart delivers the product to the end of the level where a lift drops it at the next picking station. One of the warehouse jobs laborers dislike the most is unloading and stacking. Fortunately, robots are designed to accomplish such tasks with built-in 3D vision sensors. These sensors help robots determine pallet sizes so they place larger ones on the bottom and smaller ones on the top of a stack. It is anticipated that such robotic developments will not displace workers, but will instead help workers increase their overall efficiency. Kiva Systems, based in Boston, creates ground-based drones that deliver packages throughout warehouses and distribution centers. In most of its setups, Kiva incorporates custom shelving known as pods. These are mobile and flexible enough so robots can move them easily around a space. A Kiva installation also includes a grid of 2D QR code installed on the floor of the space, an intelligent pack station with scales, lasers, and sensors, and a software system that links these components all together. In 2012, Amazon Inc. bought Kiva for $775 million and renamed it Amazon Robotics, Inc. Since then, Amazon deployed Kiva robots. It started with 15,000 robots and has since grown to 45,000 robots. 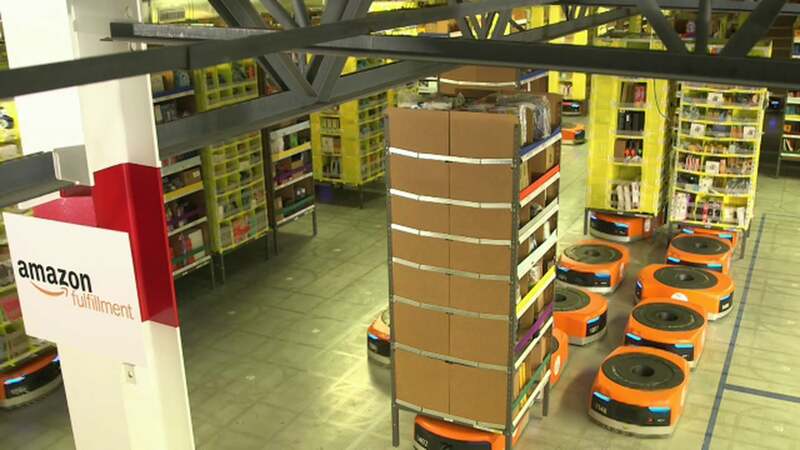 Note that not all Amazon warehouses are now utilizing Kiva robot automation. However, those that are experienced significant expense reductions of 20%, or $22 million in savings per center. This comes as a direct result from increased efficiency. Before the robots, a typical cycle in an Amazon fulfillment center would take 60 to 75 minutes. With the robots, the cycle is reduced to 15 minutes, even though the inventory space expanded by 50%. The space expansion was made possible because Kiva pods create more efficient use of the available space. These improvements are expected to continue as Amazon integrates more Kiva robots in its fulfillment centers. Another company based in Canada called Clearpath Robotics Inc. created a robot named OTTO to enhance workflow in warehouses. It is intended to relieve burdens of moving materials around so that human laborers can devote their time to higher value activities. OTTO is a self-guiding robot that delivers goods around a floorspace. Unlike Kiva’s robot, “OTTO’s intelligence allows it to ‘learn’ the warehouse landscape without the aid of a floor-guided track system.” The robot can be told a point of interest and will navigate itself to that location at a constant, safe speed. Clearpath Robotics makes other robots for land, air, and sea applications. In October 2016, a study was conducted to analyze the priorities in warehouse investments. It was found that almost 40% of the interviewed warehouses were investing in automation from 2016 to 2019. Those interviewed understood that e-commerce fulfillment is labor intensive and costly, and that the optimal way to deal with it is via automation. Furthermore, in the same study it was hypothesized that 3D printing will lend a hand in promoting development and adoption of robots and drones in warehouses and distribution centers. The International Federation of Robotics held a panel at the end of 2016 to discuss the future trends of industrial robot installations from 2016 to 2019. It is anticipated that during this time period, human-robot collaboration will grow, becoming more beneficial than previously anticipated. The top 5 nations with expansive robotic applications are China, Japan, United States, South Korea, and Germany. There will be continued growth in the United States, in such a way that from 2016 to 2019 growth will amount to 5% to 10% per year. Since January 2017, warehouse worker salaries increased 6% compared to the 2.8% increase seen in all other professions during this timeframe. In March 2017, 945,200 jobs were accounted for in the warehouse and storage sectors alone. This marks a 5.3% increase from 2016. Just as Amazon is increasing its robot installations, it is also increasing its number of available positions. In April 2017, Amazon announced it was creating 25,000 more jobs for part-time workers. Although some workers are concerned their salaries will decrease or they will lose their jobs, many companies that automate their warehouses are finding new ways to benefit their workers. They are being given new incentives and opportunities to increase individual output and efficiency. During holiday seasons, the part-time offerings are attractive to temporary workers, such as students. Robots that are developed for warehouses are intended to work alongside human laborers. Known as collaborative robots, these robots will reduce the number of steps in a process that a worker would traditionally undergo to fulfill an order. In a collaborative setting, a worker may take a product off a shelf and put it on a rack that is led by a robot. The robot would then bring the product to workers at the next station, where they will be packaged and then shipped. Such advancements will benefit the workers by helping them increase their productivity and efficiency. Collaborative robots are already in high demand. In 2012, Boston-based Rethink Robotics Inc. introduced Baxter, a humanoid capable of kitting, packaging, loading, unloading, machine tending, and material handling. Costing $25,000, Baxter is a viable solution for some businesses seeking to improve functionality and manufacturing processes. Rethink Robotics has started a new generation of industrial robots called Sawyer. This one executes many tasks that traditional industrial robots were incapable of. Sawyer is applied to CNC machining, PCB handling and ICT, metal fabrication, molding operations, packaging, testing and inspection, and loading and unloading. Sawyer works collaboratively and safely alongside human workers. European companies are also developing collaborative robots. KUKA, a German manufacturer, is one of those companies. It created a one-armed lightweight robot to automate “delicate, complex assembly tasks…it has sensors to optimize safety [and] fast teaching… [to] work safely and practically alongside humans.” Similarly, Universal Robots, a Danish manufacturer, creates robots that automate almost anything, from painting to labeling to loading products. The company has three collaborative robots that can be integrated into almost any production environment. They are designed to mimic the size and flexibility of a human arm. Many industries already employ these robots, including automotive, food and agriculture, furniture and equipment, electronics, metal and machining, plastic and polymers, pharma, and many more. Their list of applicable abilities are endless, including picking and placing, lab analysis and testing, polishing, machine tending, screw driving, and more. Other collaborative robots have been made and introduced into the services industry, facilitating to the needs of customers during in-store experiences. Many companies currently invest in warehouse automation in order to remain competitive in the digital economy. Quiet Logistics: Although this company is not directly engaging in the digital economy, it is an e-commerce fulfillment provider for online brands that include Zara and Bonobos. Quiet Logistics launched the petite Locus robots in its warehouse facilities. They work alongside human laborers. Their job is to pick up products and bring them to the workers to package and ship. These robots are expected to increase productivity by 80%. Adidas: This shoe manufacturer revolutionized its factories and warehouses with robots. Over the next year or so, it plans to produce over 500 pairs of running sneakers with robots. Adidas will still have human laborers who complete parts of the assembly process; however it is looking towards more automation of the overall manufacturing process. Adidas is also exploring 3D printing of soles for the Futurecraft 4D shoes with Silicon Valley startup Carbon. The printing speed is 10 times faster than other 3D printing methods which will help Adidas, coupled with its increasing automation, produce over 100,000 pairs of the Futurecraft 4D shoes. Patagonia, Inc.: In an effort to keep up with high demand for products during the holiday season, Patagonia turned to Dematic Corp., a supplier of logistics systems for factories. Dematic offered the company belt-driven technology that controls the speed at which materials move along conveyor belts. This is meant to optimize efficiency and decrease the issue of bottlenecks from arising. As a result, within 9 months, man-hour efficiency increased 20% and power consumption was reduced by 30%. Zappos: This incredibly popular and successful online retail company, now owned by Amazon Inc., has a solid reputation for its customer service and satisfaction. It ensures that deliveries occur within 24 hours or an order placement. Zappos upholds this policy with the use of warehouse and distribution center automation. The company has completely automated warehouses based on Kiva systems. As a result of automation, Zappos also reduced energy costs by 50%. UPS Worldport: This is the hub for the UPS and is located in Kentucky. Because of its use of robots, the center can handle over 84 packers per second, translating to over 416,000 per hour. This helps it deliver on time and maintain customer satisfaction levels. Ikea: Considered one of the leading “speed” furniture companies in the world, Ikea gains this title in part from its automated warehouses. They have automated storage and retrieval systems that capitalize on warehouse space. As a result, they can store even more products. At peak efficiency, 13 cranes that comprise one warehouse, for example, can move over 600 pallets per hour. This translates to almost one pallet per minute per crane. Storing, processing, and shipping are faster now than in the past. Orders are completed within 24 hours, when in the past, it would take over 72 hours per order. C&S Wholesale Grocers: The CEO, Rick Cohen, founded a company called Symbiotic to create technology that automates distribution center processes. At first, the system was made just for the grocer’s facilities, but since then it has been tested by Target, Walmart, Coca-Cola, and various other companies. 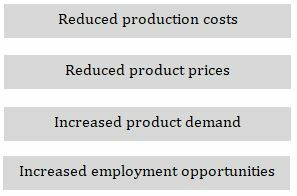 As it pertains to food retailers and wholesalers, it is anticipated to diminish distribution center labor costs by 80% and allow operations to exist in warehouses that are 25% to 40% smaller. Seegrid Corp.: This Pittsburgh, PA-based company created robotic pallet trucks and tow tractors. Unlike some other robots, these do not require additional infrastructure. The vehicles use evidence grid technology to navigate. In other words, they combine multiple views of an environment to generate probabilities about the space and where they can travel. 360 degree stereo cameras are mounted on the vehicles to produce the images and discern viable travel routes in a given space. The average forklift operator would cost between $20 and $35 per hour. A Seegrid robot, on the other hand, works for as little as $2.24 per hour. In recent years, research and development funded the adoption of robots in warehouses and distribution centers. This form of automation is required for companies to keep up with consumer demand that is derived from e-commerce and the modernizing digital economy. These robots are intended to work alongside existing warehouse workers who are taxed with tedious, time-consuming tasks that often deter people from seeking out these types of jobs in the first place. But now, warehouse and distribution center automation creates new avenues for improved productivity and efficiency. Companies and individuals engaging in the development and integration of warehouse and distribution center automation are now eligible for R&D federal and state tax credits.